It’s question with a seemingly obvious answer, but we consistently get asked this seemingly simple question on a weekly basis. What is the difference between a customer and a user? A customer is an individual who has an interest in contributing feedback with your organization, but who does not need access to the internal workings of any specific project. This customer can include other businesses, individual customers, or even members of a sales team, depending on how you define their role. Anybody who uses the customer portal is considered a customer. This can even include colleagues and business partners. The number of customers you can have is unlimited. Internal users count towards your total # of users that you have subscribed to on your plan, whereas inviting an external user does not. External user accounts are created as a free trial and as with all of our trial accounts, have access to all of OneDesk’s features, but cannot invite users of there own once the trial has expired. 3. For Customer or Customer account, you must select the “All Projects and Releases” view from the drop down menu. Customer’s can only submit feedback via e-mail or the customer portal. You can also import customers and accounts using a .csv files from your existing excel documents. To do this simply proceed as above but select the tools drop down and select the customer or account .csv file that you want to import. 1. Select users & customers from the application dropdown menu. 2. Select the customer you wish to invite. 3. Choose actions on the menu bar and click “send invitation”. This will send an invite to your customer to submit feedback on your customer portal. 1. Select a project from the drop down menu that you want to share. 4. 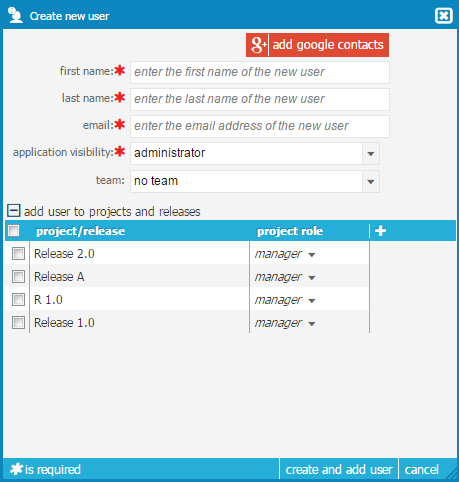 If the user already exists, select them from the drop down menu and choose their role. * You can also add contacts from your Google account. User’s can be assigned to teams and customers can be assigned to customer accounts for easy organization.